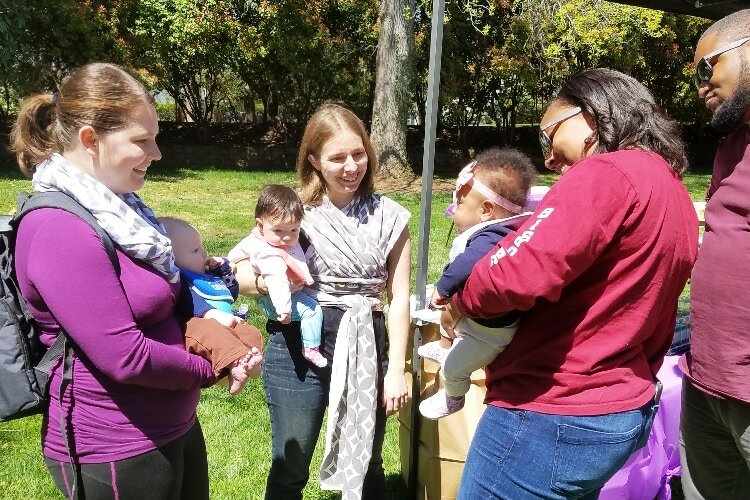 ​'Before Baby' ﻿﻿﻿﻿Moms ﻿﻿﻿﻿Club ﻿﻿of Virginia﻿﻿ focuses on providing educational services and support to pregnant women by working with community partners to establish Moms Clubs across our service area. The 'Before Baby' Program focuses on six core topics that are vital to healthy pregnancies and healthy babies. Our initiatives and goals are to support pregnancies through personal interaction, education, and community. There is no cost to attend. We hope you will join us at a meeting soon. ​for their continued support of our mission to promote healthy pregnancies. On March 14, 2019, the Chesterfield Health Department will be offering a 1-day BB Moms Club of Virginia Facilitator Training at their facility located at 9501 Lucy Corr Circle. The training will run from 8:30 a.m. until 5:30 p.m. This opportunity is made possible through grant funding from the March of Dimes Virginia Chapter. The training is open to the first 30 registrants and is there is no charge to attend. Check out our new "Presentations" page! in the US and around the world make changes for themselves and their families. Lisa is especially proud of the international efforts currently in Liberia and Bangladesh where they are reaching parents and providing them with education through books, videos, and group meetings. ​Click the logo or here to visit the website. 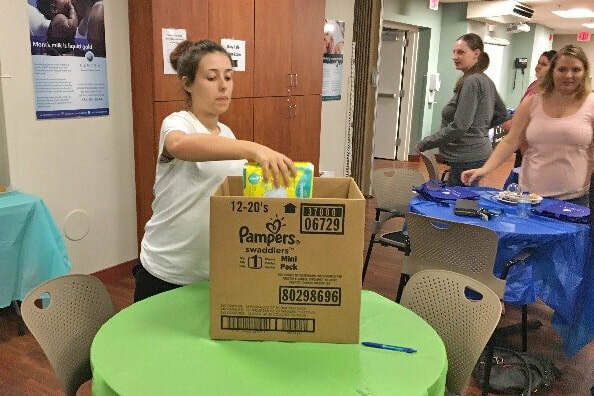 Through the Healthy Beginnings Program, William & Mary staff work with local jail and prison facilities to provide nutritional support, prenatal vitamins and other essential health care resources to pregnant women entering those facilities. The program also helps incarcerated and newly released parents transition to caring for an infant in the first year after pregnancy. “The majority of pregnancies have resulted in positive outcomes, thanks to the Healthy Beginnings Program and the support of our partners, including the March of Dimes,” said William & Mary Associate Professor of Psychological Sciences and Director of Graduate Studies Danielle Dallaire. “Participants in the program have demonstrated better birth outcomes, including higher birth weights and longer gestation periods.” According to Dallaire, if Healthy Beginnings is able to reduce the preterm birth rate of just 10 incarcerated women, it is estimate to save the state $500,000 in infant medical care related expenses. Healthy Beginnings was founded in 2012 by Dallaire and Associate Professor of Psychology Catherine Forestell, and is the first program of its kind in the U.S. It is comprised of an interdisciplinary team of professionals, educators, medical personnel and students who are committed to supporting healthy pregnancies and babies through promoting healthy behaviors, education, awareness and empowerment. The March of Dimes funding follows similar grants from the W.K. Kellogg Foundation and the Anthem Foundation for the program. Alyssa Eversmeyer ’18 is one of the five students currently involved with the program. Students enter data, help with research and assist in community outreach. She says Healthy Beginnings is not just something that helps women get through pregnancy, but provides support every step of the way. 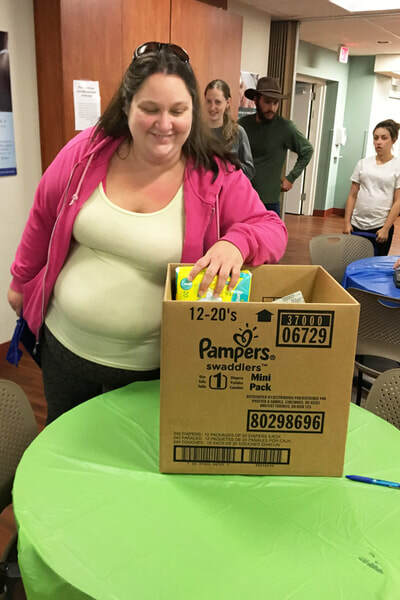 “There is a variety of important social services we provide like helping them get a car seat, substance abuse help, diapers and housing,” Eversmeyer says. 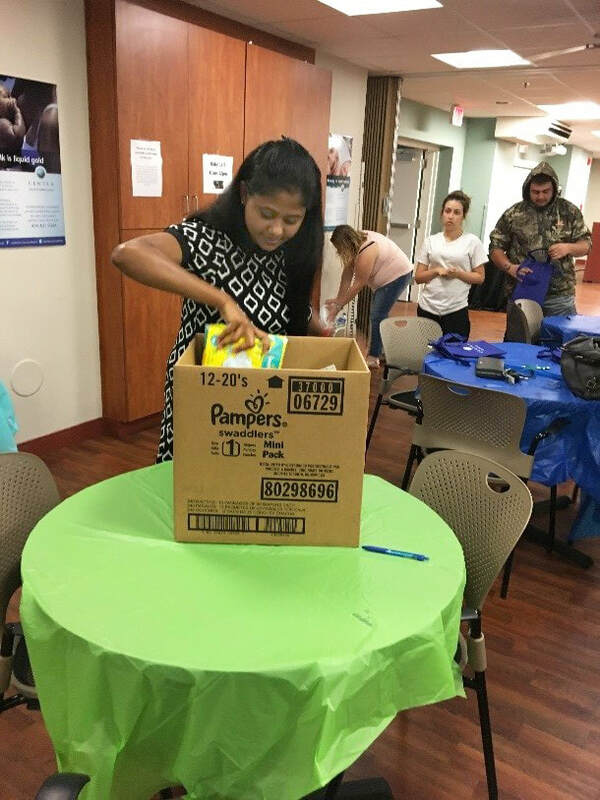 The Healthy Beginnings Diaper Bank is another great resource for mothers in the program. 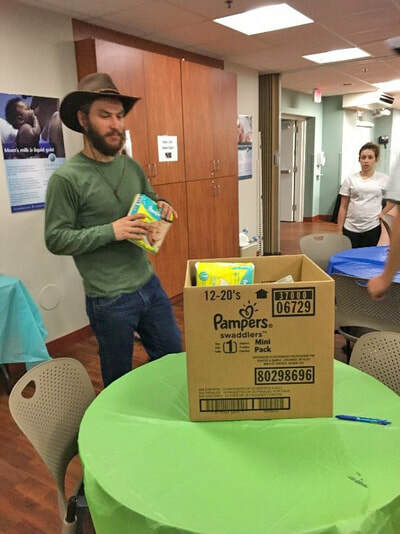 It also provides diapers for mothers throughout the Williamsburg area. 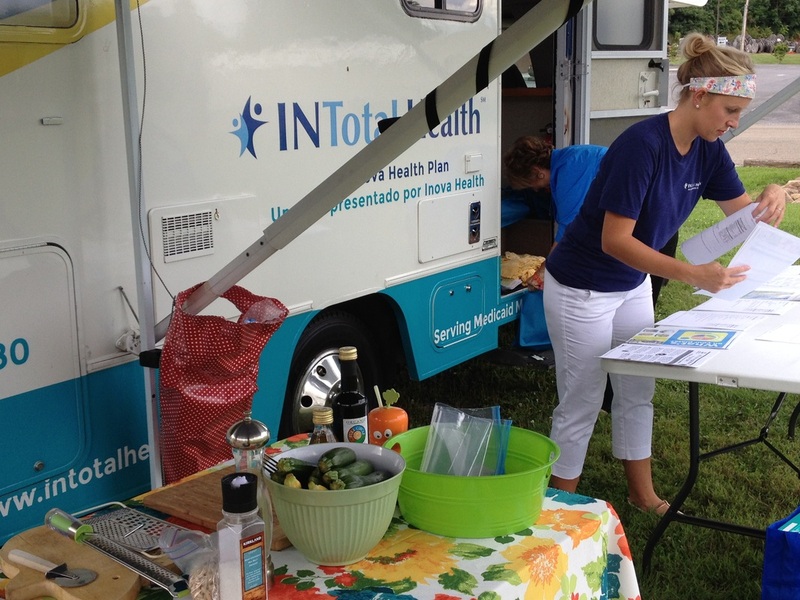 Health education is also an important part of Healthy Beginning's mission. The program’s research shows that improved nutrition knowledge leads to longer pregnancies and healthier babies. Angela Boland, a licensed clinical psychologist and program coordinator, visits the incarcerated women enrolled in Healthy Beginnings. ​Adopting SCRIPT in Your Organization (SCRIPT) train-the-trainer workshop for health professionals was held on July 28th at March of Dimes office in Glen Allen, VA. SCRIPT is an award-winning, evidence-based program that has helped thousands of pregnant women quit smoking. ​It is cited by the Agency for Healthcare Research & Quality’s Smoking Cessation Clinical Practice Guidelines. 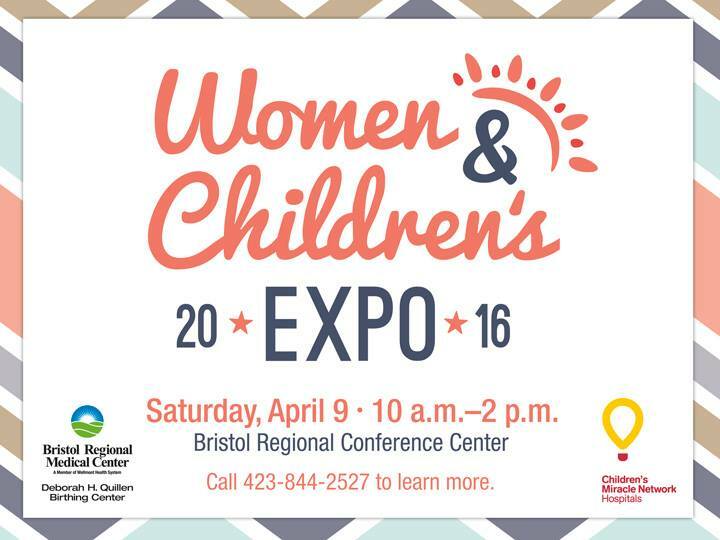 A relaxing day filled with education, giveaways and healthy opportunities awaits attendees of the annual Women and Children's Expo at Bristol Regional Medical Center. 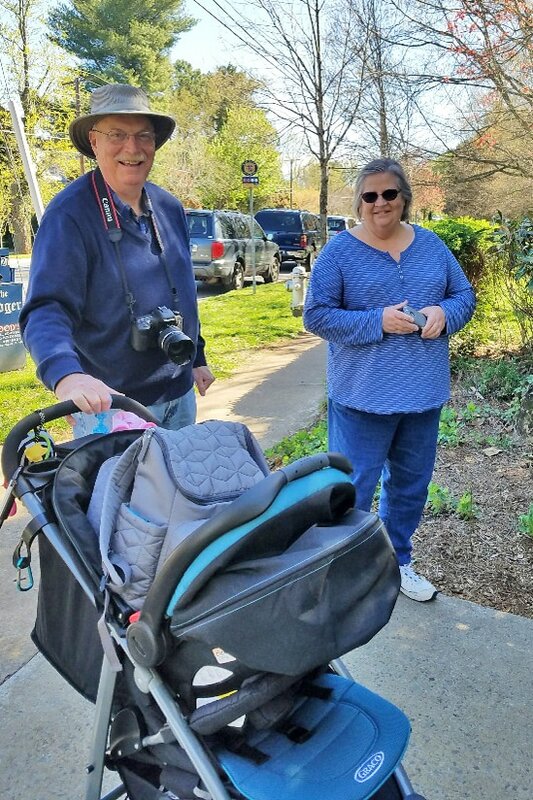 The "Strolling for Babies" plan came to a great conclusion as Lynchburg moms and dads returned along with their babies in strollers to support March of Dimes and March for Babies on April 18th. Sporting colorful signs and lots of smiles, it was a great day of fun for these Moms Club graduates! Well done, Lynchburg! 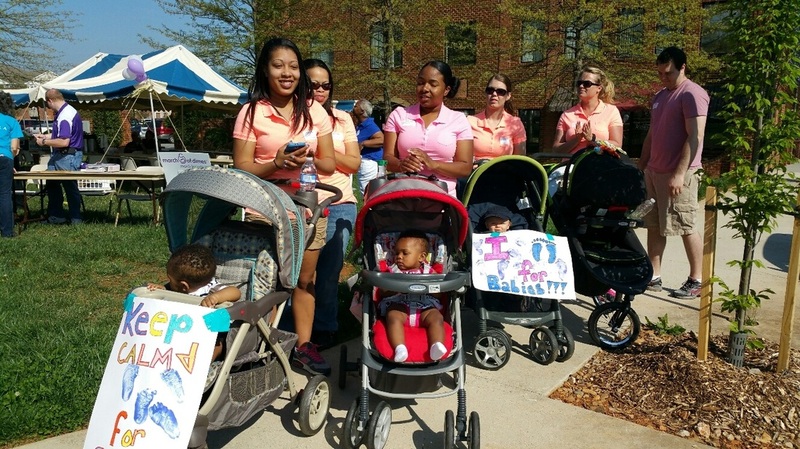 Lynchburg Moms (and Dads) Plan "Strolling for Babies"
March of Dimes Virginia Chapter announced its 2015 Grant Recipients on January 30th. 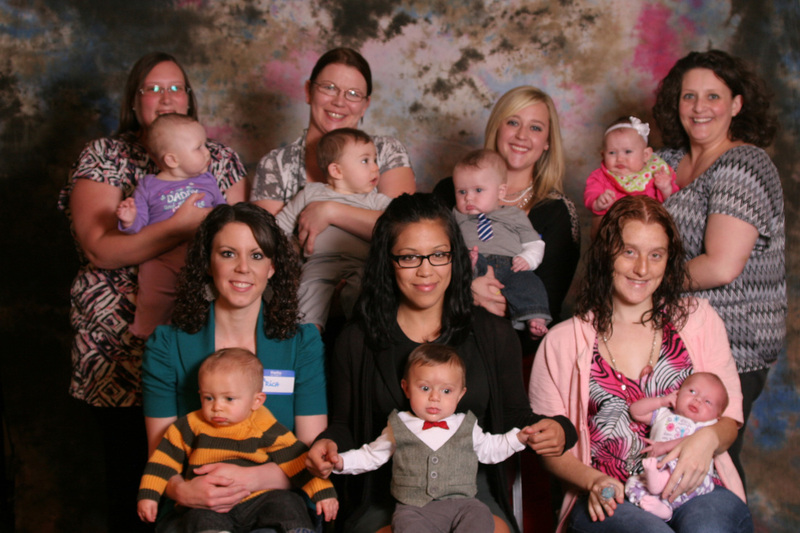 These grants make it possible to add new Baby Basics Moms Clubs to our BBMC family. 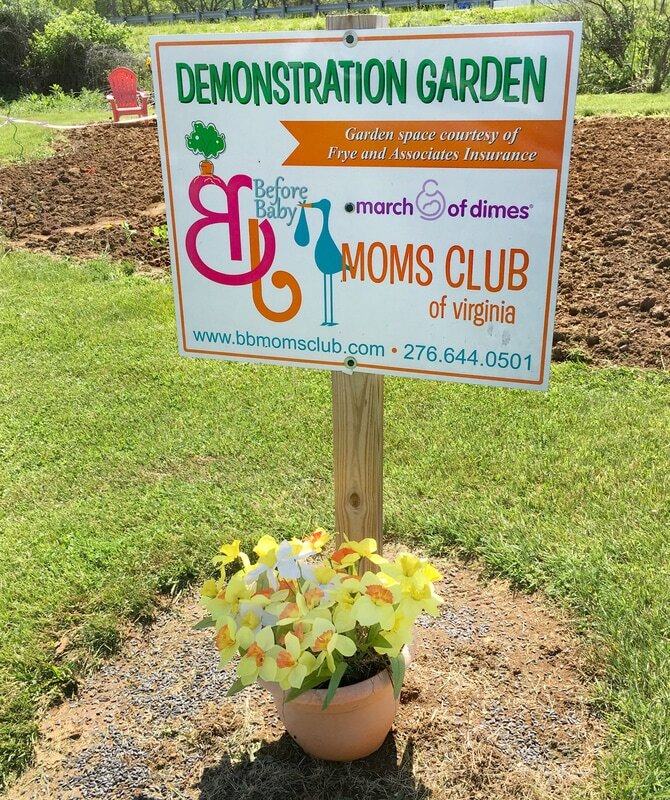 'Before Baby' Moms Club of Virginia is a signature program offered by March of Dimes to address issues impacting poor birth outcomes and assist moms-to-be in having a healthy pregnancy and a healthy baby. New club sites will launch in the Mount Rogers Health District at the Smyth County Health Department, Johnston Memorial Hospital, and Washington County Health Department. 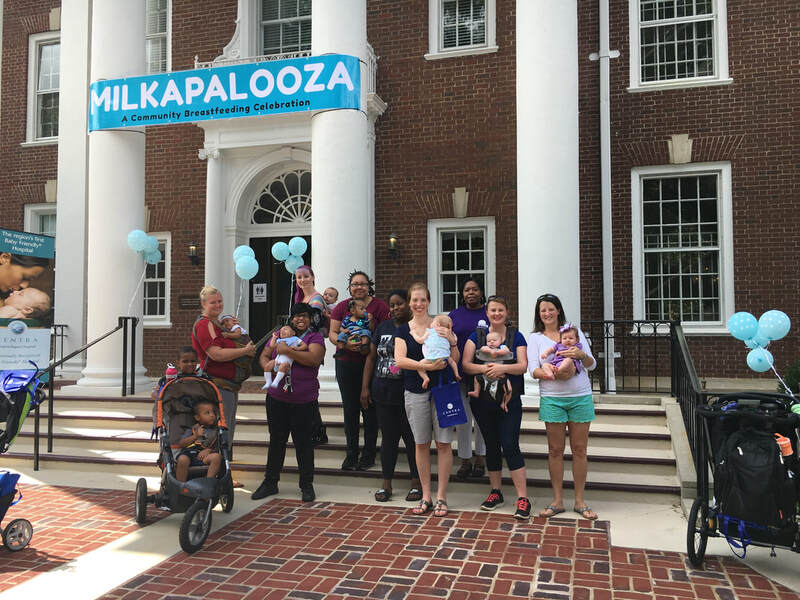 Other new sites include the College of William & Mary hosting three Moms Club programs for incarcerated pregnant women, the University of Virginia adding a Spanish club along with their English speaking group. 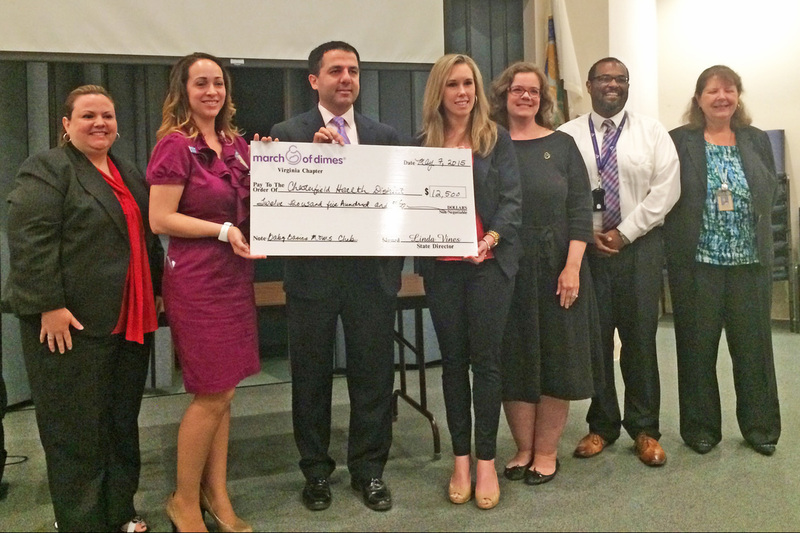 In Newport News, March of Dimes welcomes Riverside Brentwood Medical Center, joining Bon Secour Mary Immaculate and South Eastern Family Project. Also new to the team is Virginia Commonwealth University. As each new club is ready to launch, information and calendars will be added to the website. Meeting sites continue to be offered at Wellmont Bristol Regional Medical, Carilion New River Valley Medical Center, Carilion Roanoke OB Clinic (English/Spanish), Centra Health at Virginia Baptist Hospital, Martha Jefferson Hospital in Charlottesville, University of Virginia and Chesterfield Health Department. Joey McKenna along with his dog, Doja, is hiking the Appalachian Trail which covers 14 states and roughly 2,180 miles from Maine to Georgia. Along the way, he was inspired to create a fundraiser to benefit the March of Dimes Foundation. Joey is the son of Merry McKenna, Executive Director of 'Before Baby' Moms Club. Karen Davis, our Washington County Moms Club facilitator, is a finalist in the annual March of Dimes Virginia Nurse of the Year Awards Program. She is a Southwest Virginia native, mother of two, and holds a BSN in Nursing from ETSU. She has worked over 20 years within the public health sector for both Virginia and Tennessee Departments of Health. These awards honor excellence in nursing care and pay tribute to the men and women who work for positive changes within the healthcare community. Over 325 nurses were nominated across Virginia by patients, friends, co-workers, and other health professionals from which 121 finalists were chosen. Award recipients will be announced on November 1st at a gala event in Richmond. Congratulations to everyone who was nominated, and we are especially proud to have Karen as part of our Baby Basics Moms Club team! 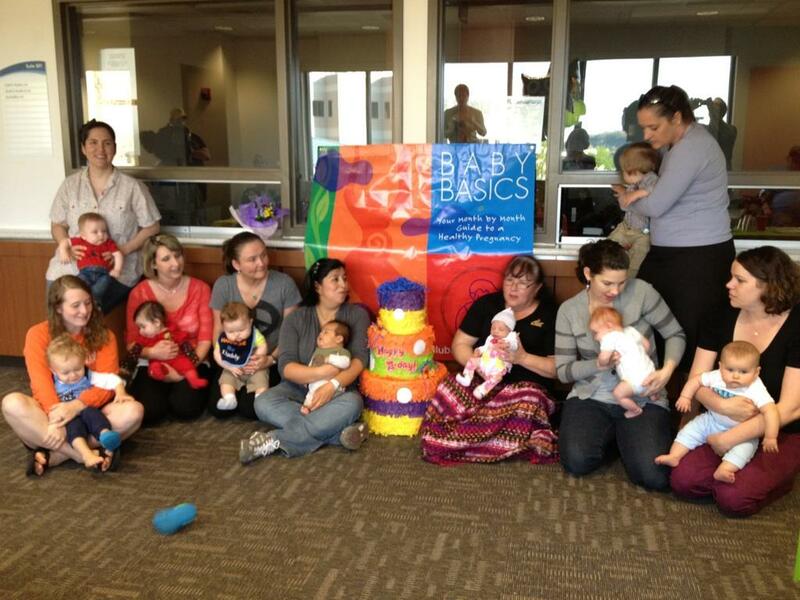 'Before Baby' Moms Club of Virginia is excited to announce the launch of Baby Basics Moms Club in Newport News. The club will officially kick things off with an Open House on Tuesday, August 26, from 5 to 7 p.m. at the Community Education Building/Conference Center at Mary Immaculate Hospital, Newport News. The group is free, fun and on a drop-in basis, according to its organizer, Liz Marshall. "All pregnant women are welcome," she said, along with a friend or family member. Funding for our newest club is provided by March of Dimes. Newport News Moms Club will meet from noon to 1:30 p.m. on the first and third Tuesdays of each month; and from 9:30 to 11 a.m. on the second and fourth Thursdays. Refreshments and giveaways will be offered at every group. Read more in this feature article from the local Newport News Daily Press. It Was a Great Garden Party! 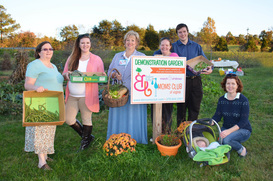 It was a garden party at the Moms Club Demonstration Garden Monday night, July 28th. Bristol area Moms Club participants from JMH, WCHD and BRMC joined us between the tomatoes and peppers for an evening of fun. 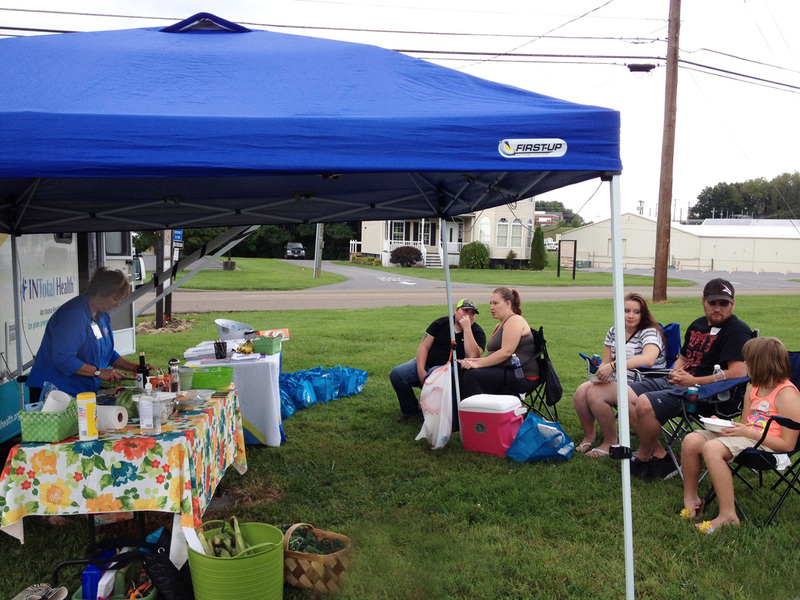 Club facilitators and guests provided a cooking demo using veggies straight from our own garden. 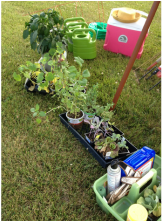 All moms and visitors were able to pick fresh produce to take home with them. Please feel free to stop by, pull a few weeds and pick from the garden. Thanks again to Frye-Shaffer Insurance for the use of this great garden space. 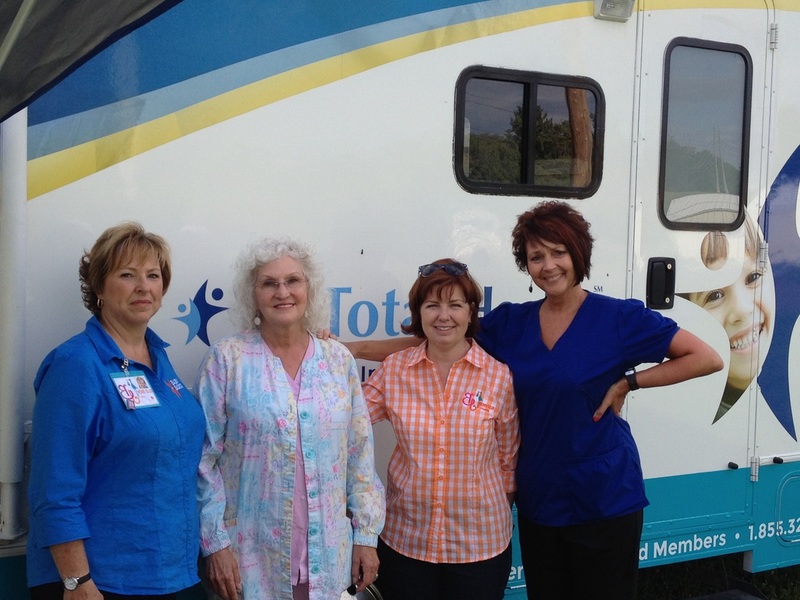 INTotal Health joined us with their mobile unit, provided treats for our moms and plenty of cold beverages. A special thank you to the moms and visitors that joined us and for those that continue to work in the garden to make sure our harvest is a winner! 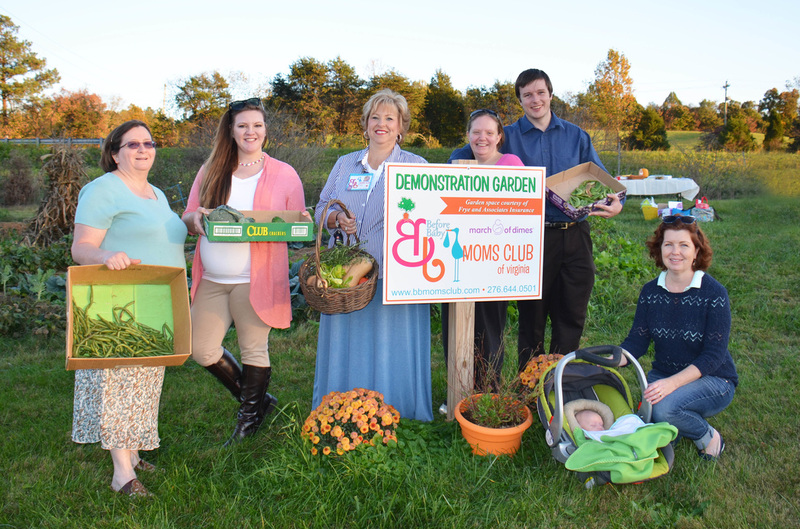 Healthy eating starts from the ground up and that’s just what the Moms Club Team in Southwest Virginia aims to offer pregnant women. Expecting moms want to do all they can to have a healthy pregnancy and healthy baby. An important part of promoting good health is taking a look at the way we shop for groceries and the way we eat. 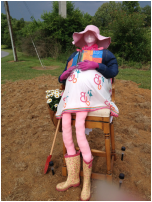 The Moms Club of Bristol, Washington County and Johnston Memorial Hospital have put on their garden gloves, loaded up their wheelbarrows and headed to the garden to help expecting women learn more about growing their own food and shopping fresh. 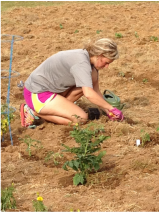 It’s about the whole process from planting your garden, cultivating, harvesting and cooking it up for your family. We want moms to experience the rewards of growing vegetables and fruits and integrating them into their daily diet. Our garden demonstrates the various steps and lets our moms be part of the journey from seed to dinner plate. 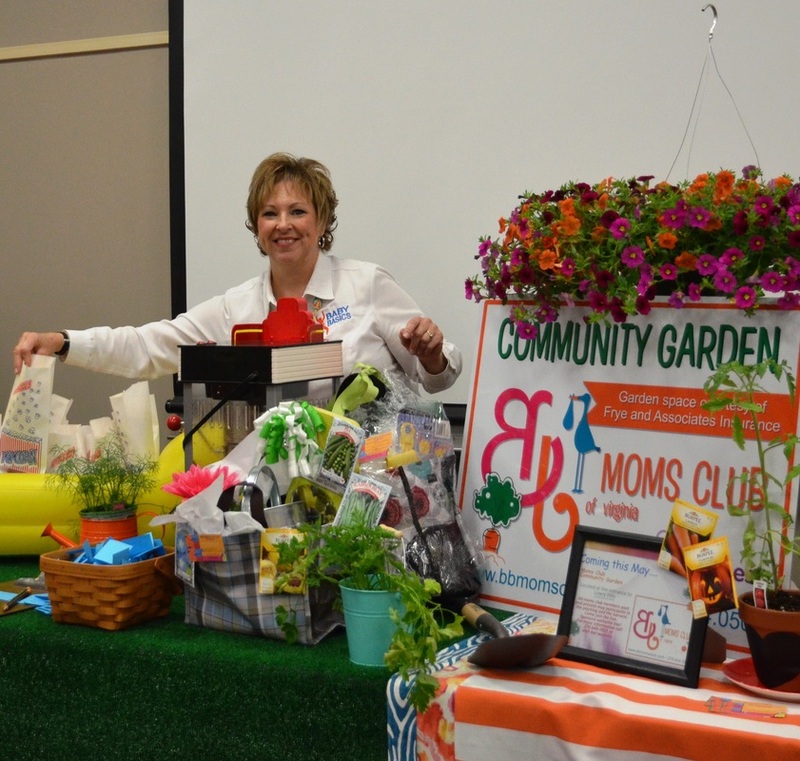 Moms have the opportunity to hear speakers about growing and tending a garden, nutritionists about ways to prepare what they have grown and learn from both novice and experts the secrets to the best tasting veggies. 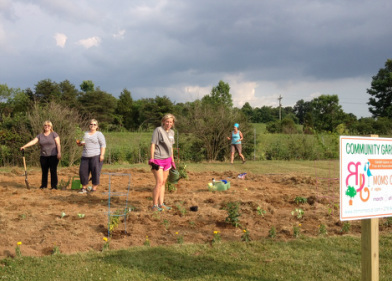 It’s also a chance to pull weeds, water plants and share in the bounty of what we grow. All pregnant women, Moms Club Moms past and present, are invited to participate in the fun. We also encourage our community partners that have knowledge they would like to share to contact us about joining us in the garden. Garden space has been provided in-kind by Frye-Shaffer Insurance. We are located at the entrance to Lowry Hills on Old Dominion Road (off Lee Hwy), directly across from the DMV and beside Frye- Shaffer Insurance. Just look for the pregnant lady in the garden. BB Moms Club of Virginia hosted a one-day training for facilitators implementing the Virginia Model program on June 10, 2014. This fun and informative day included information on how to replicate our group model program that is being successfully implemented in 10 sites across Virginia. This training was sponsored by the March of Dimes Virginia Chapter in Glen Allen (near Richmond). 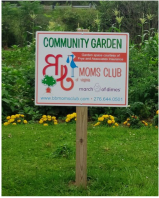 If you are interested in requesting training to bring Moms Club to your organization or community, contact Merry McKenna at 276-644-0501, or email merry@bbmomsclub.com. 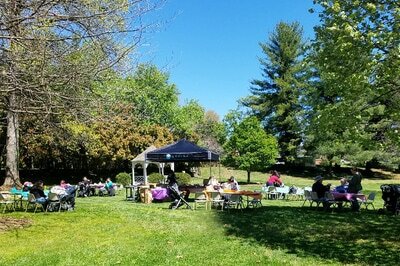 March of Dimes supporters gathered at Sugar Hollow Park, Bristol, VA, for the 2014 March for Babies. Participants from the Washington County Moms Club were on hand to support the March of Dimes effort to help babies begin healthier lives. Pictured with the Baby Basics Moms Club sign are Lydia Landis (L) of Care Connection for Children and Nikki Hicks (R), March of Dimes Community Director. Baby Basics Moms Club of Virginia welcomes Virginia Premier Health Plan to the team of club sponsors. If you’re pregnant, they are excited and we are too! 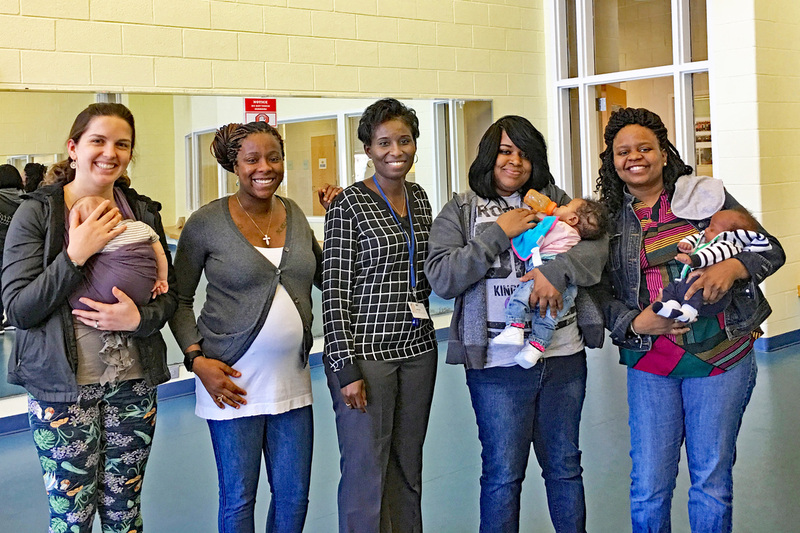 The combined efforts of VA Premier's Healthy Heartbeats Program and BB Moms Club of Virginia offer expecting moms the opportunity to learn about having a healthy pregnancy and a healthy baby. To learn more about Virginia Premier Health Plan visit their website at www.vapremier.com. We want to also express our appreciation to INTotal Health (formerly Amerigroup Virginia LLC) who has our new baby bums covered with diapers for moms attending Abingdon Moms Club. We are also excited to have their support for special nutrition surprises for participants. Come and join us as we learn about healthy snacks for the mom-to-be. To learn more about INTotal Health visit their website at www.intotalhealth.org. The Abingdon Moms Club has a new name and a new sibling! 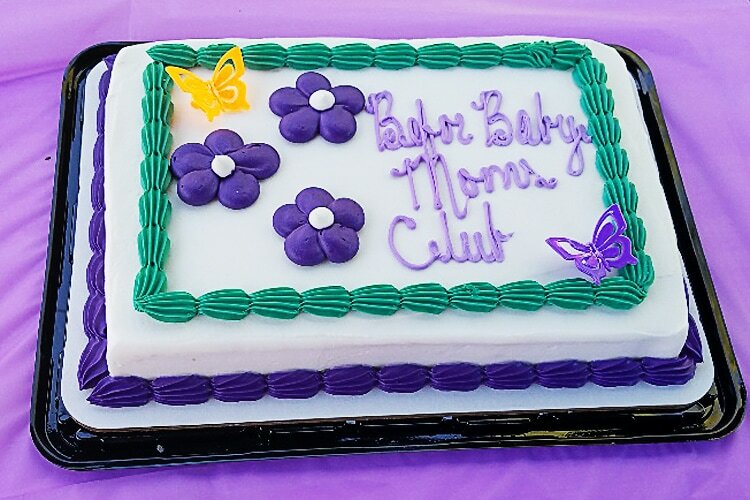 On February 25th, the newly formed Washington County Baby Basics Moms Club will begin offering club meetings at two locations in Washington County. We would like to welcome our new partners, Johnston Memorial Hospital offering meetings on the first and third Thursdays of each month from 5:30 to 7 p.m. in the Family Birth Center, and the Washington County Health Department which meets on the second and fourth Tuesdays of each month from 1 to 2:30 pm. Click here for more information on meetings times and topics. 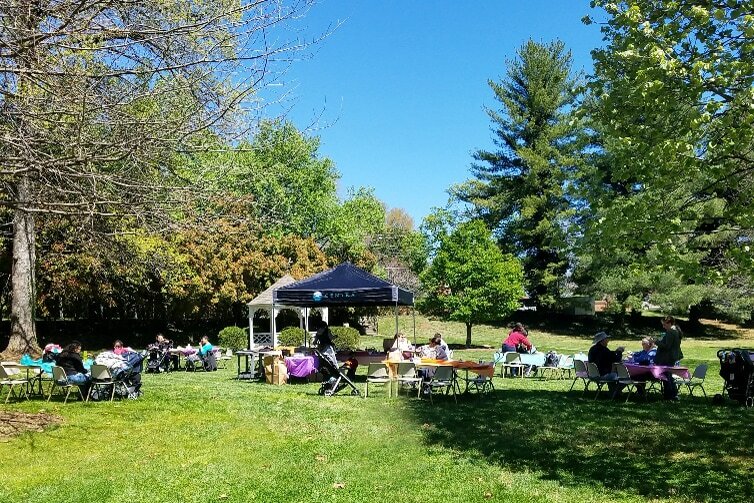 Our new Charlottesville Moms Club at Trinity Episcopal Church was the subject of a feature story by local affiliate NBC29, including an interview with Sharon Veith, one of the Moms Club facilitators. Sharon is a long-time advocate for improving pregnancy outcomes for the women of central Virginia. The club is funded through a community grant from March of Dimes and hosted by UVA Children's Hospital and Women's Health Center. Click here to read the story. 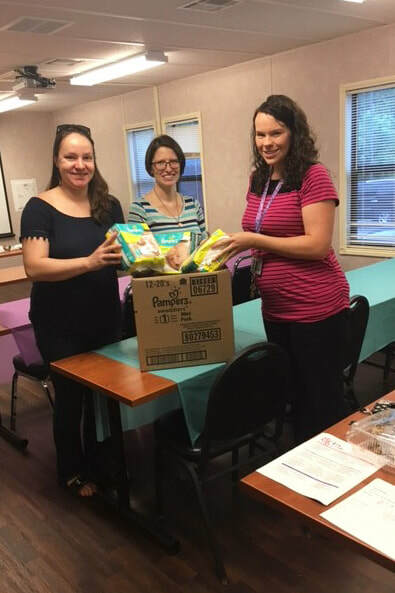 Baby Basics Moms Club is off to a great start thanks to the dedicated efforts of UVA Childrens Hospital/Neonatology and Womens Health Services staff and the generosity of the March of Dimes Virginia Chapter and our community partners. Community partners in health care, community supporters and members, along with some soon-to-be moms attended our Open House on January 27th. 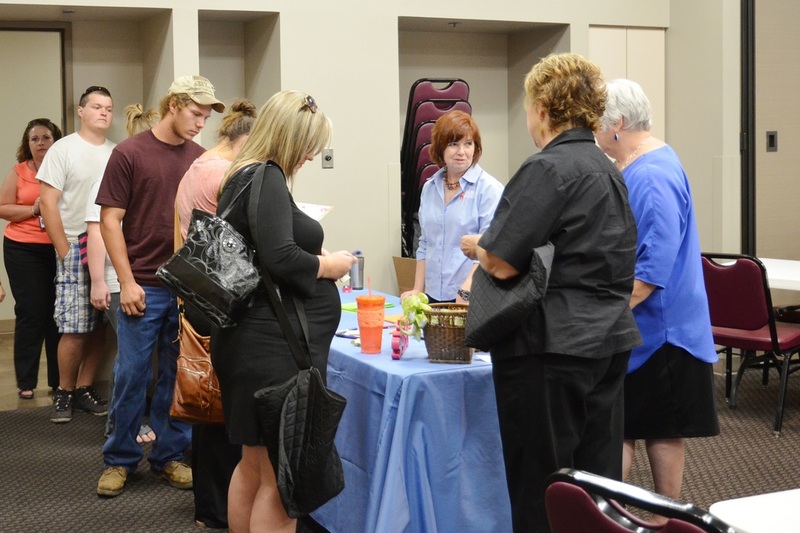 Guests enjoyed great snacks while learning more about the benefits of Moms Club from our talented staff. Everyone involved in this project is very excited about the new Moms Club and what it will mean to the community. Meetings start Monday, February 3rd, and a second Charlottesville Moms Club will be arriving soon. Click here for more photos. We want to extend special thanks to Community partners Torri Ayers from Jefferson Area CHiP and JohnJason Cecil of Anthem Health Keepers Plus for their above and beyond assistance at the Open House. Our sincere appreciation also goes to Bryan Harris of the March of Dimes and their generosity of a community grant. 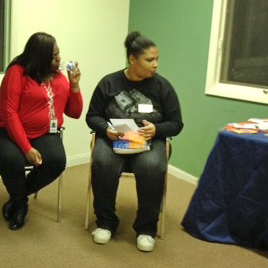 Torri (L) talks with a community member about Baby Basics as they look over BBMC materials. 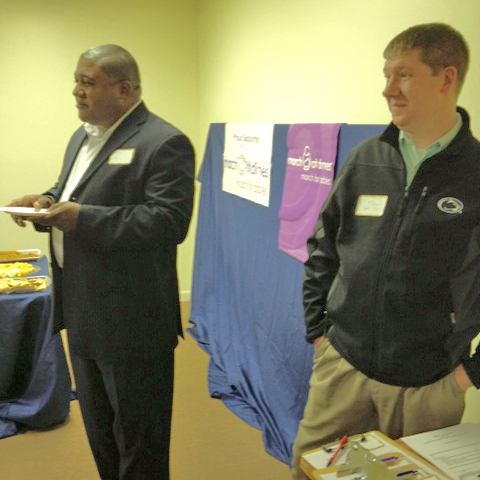 JohnJason Cecil (L) and Bryan Harris (R) listen to participants' questions about Baby Basics. Chesterfield Health Dept in Chesterfield; University of Virginia in Charlottesville; and Centra in Lynchburg. Also joining us in 2014 will be Martha Jefferson Hospital in Charlottesville. 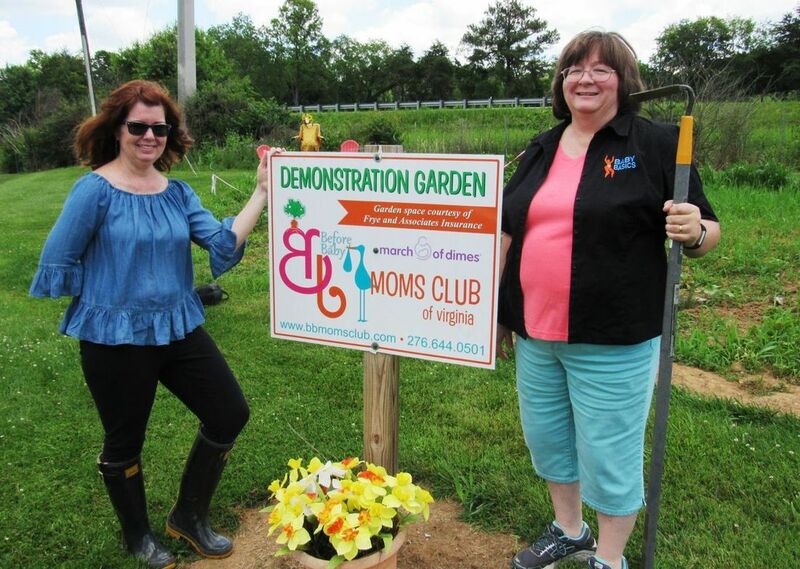 Lisa Dolinger, Abingdon Moms Club facilitator, and Merry McKenna, Before Baby Moms Club of Virginia Executive Director, were interviewed by Carolyn Wilson, a free lance writer in Glade Spring, Virginia. Read the full article with photos at SW Virginia Today, or read more on our Abingdon page. EXCERPT: The club meetings are free of charge but offer an abundance of rewards for participants. 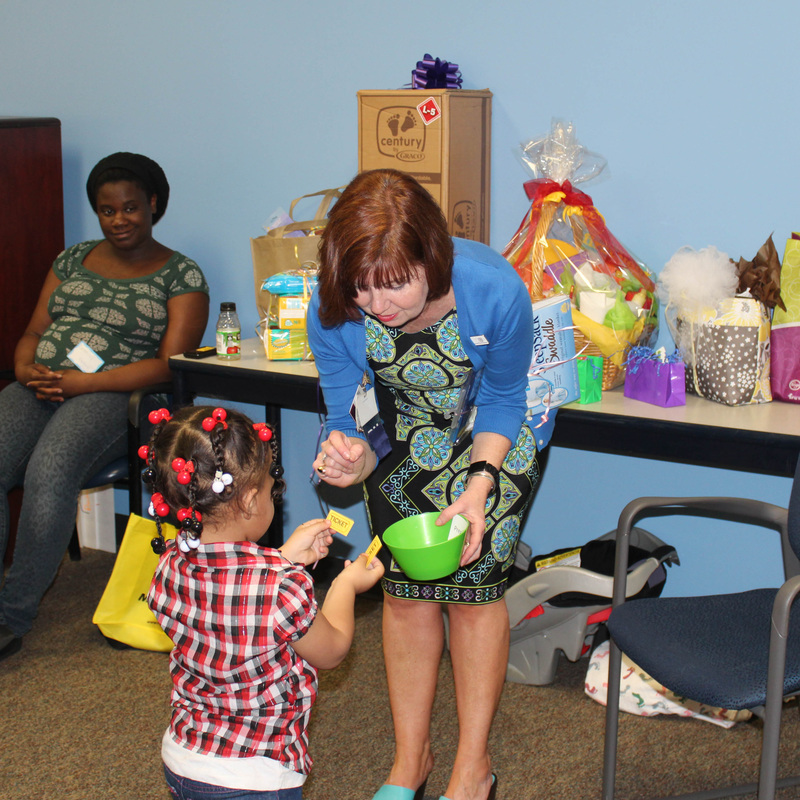 “We invite moms from all socioeconomic backgrounds,” she (Dolinger) said. 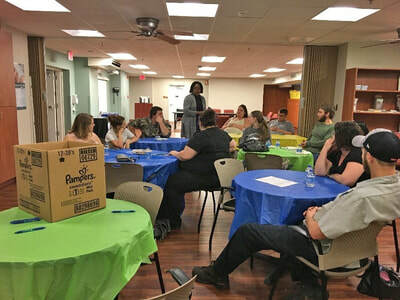 “It’s a great way for them to learn from each other, explore issues in a group setting and to make new friends.” Dolinger, a nurse at Johnston Memorial Hospital, is among trained health educators throughout the state who lead discussions and encourage participants to learn through personal interaction with other members. Ann Scott, Program Coordinator for Centra Before Baby Moms Club, is interviewed by ABC13WSET's Emily Robinson of LIVING IN THE HEART OF VIRGINIA about services they provide in Lynchburg and Farmville. Also featured is Sarafina Cooper, the new Community Outreach Specialist. ​Thank you Ann and Sarafina! 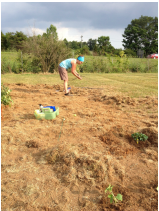 The garden has been plowed and the first tender plants and seeds are in the ground. Anyone who participates in planting or tending the garden may also participate in reaping the rewards later this season. We want to thank Frye and Associates Insurance for allowing us to use this space again. ​On April 12, Farmville Moms Club got a hands-on look at foods that are not only nutritious, but that can also fit into their food budget. To illustrate the "Eat This, Not That" philosophy, the value of nutrition was emphasized in planning family meals. Fresh fruits, whole grain snacks, and alternates to soda were on hand for our moms to sample. It is possible to eat healthier on a budget! 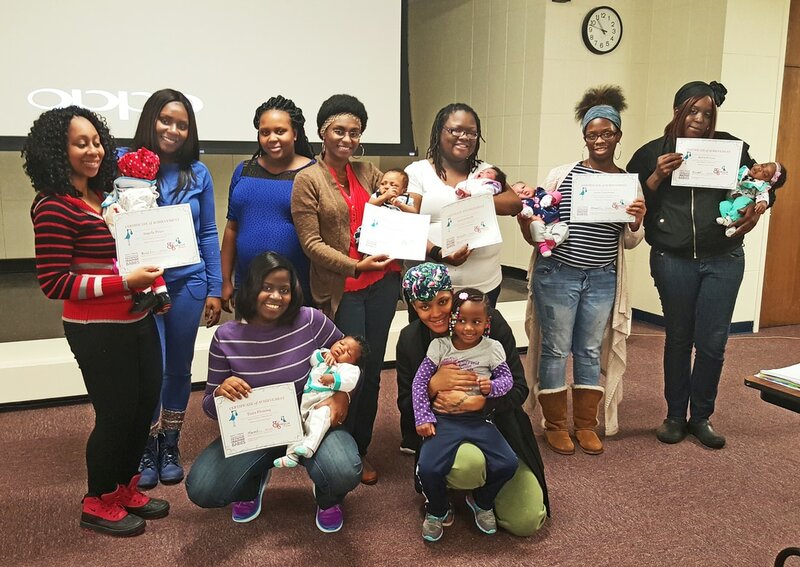 Newport News Moms Club is Back! March 16th: Club is meeting today!! Topic is "Getting ready to give birth". Please join us for group discussion, to make new friends, to find local resources. We'll meet at the Conference Room in Family Medicine from 4 to 5:30 pm. As usual, club is free and you don't need to pre-register. Partners, support teams, family members are welcome too! Hampton Baby Basics Moms Club held a grocery store tour on Decembver 6th hosted by Farm Fresh on Coliseum Drive in Hampton. 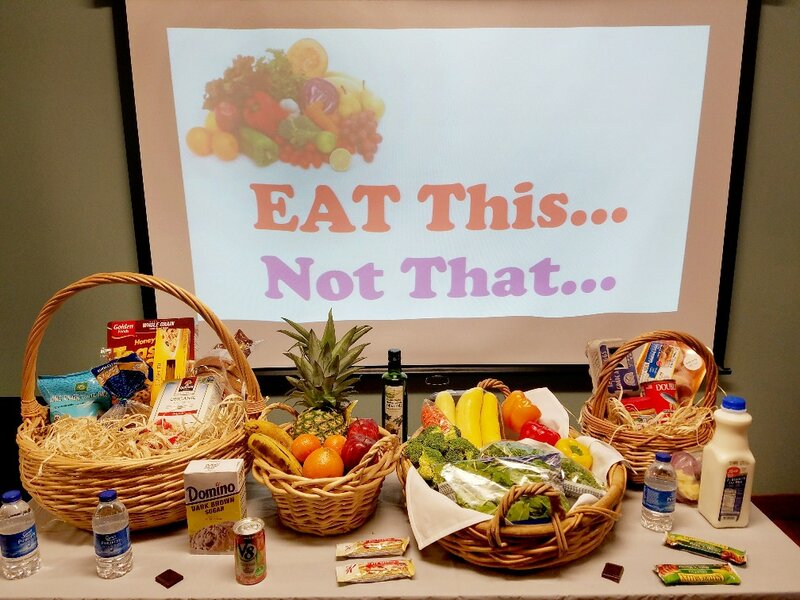 We want to express our appreciation to the staff who assisted our moms in selecting healthy and nutritional choices while shopping on a budget. 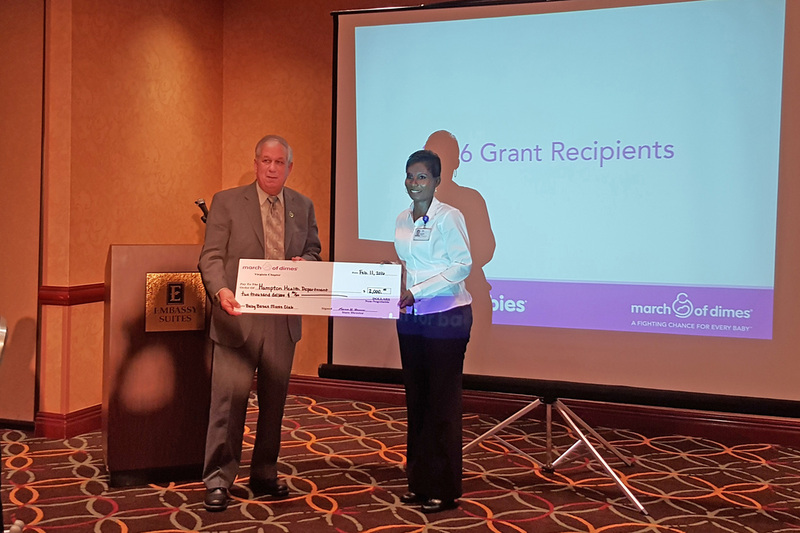 March of Dimes - Virginia Chapter presented a grant award to Hampton Baby Basics Moms Club on February 11, 2016. We would like to express our sincere appreciation to March of Dimes for their continuing support. Congratulations Hampton Moms Club! 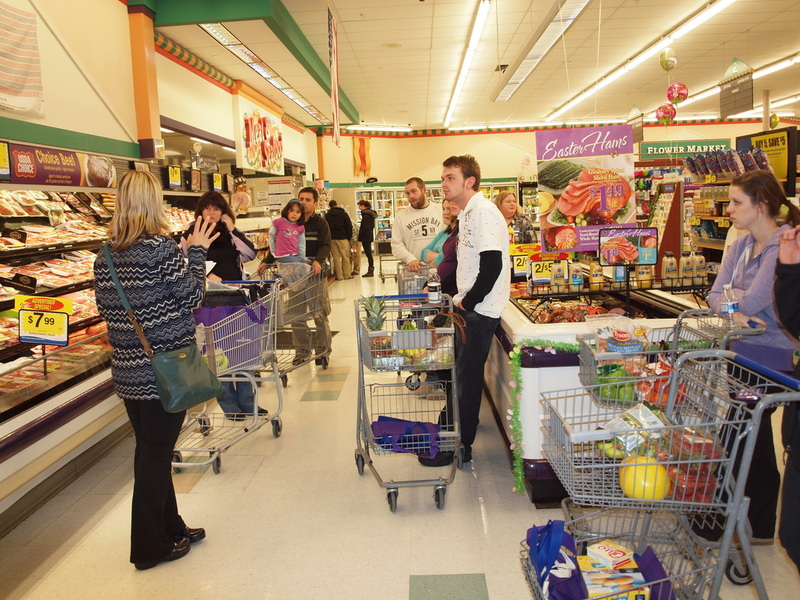 The Hampton Baby Basics Moms Club held its first grocery store tour on November 24th. We want to express our sincere appreciation to Farm Fresh on Coliseum Drive for hosting our shopping tour. The tour was led by Jordan Armstrong, MPH in nutrition student intern with WIC. 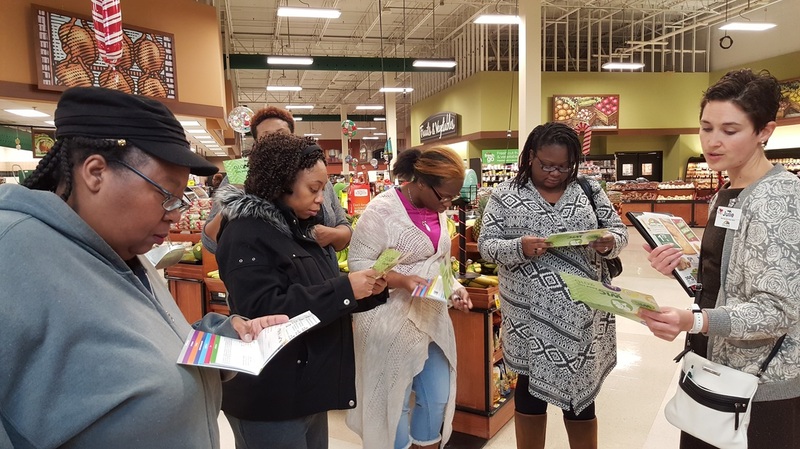 She provided many helpful tips and valuable information about making healthy nutritional choices while shopping on a budget. For the second year, our Moms Club Demonstration Garden produced a bountiful harvest of vegetables, fun, and education for all. A touch of fall in the air signals that it is again time for our annual Moms Club Reunion on September 28th at 6:00 p.m. in the Magnolia Room at Bristol Regional Medical Center. We look forward each year to getting together with our many current and past Moms Club members, and to meet any little ones that have arrived. Family members are invited and there will be prizes, freebies, and food. For more info, email Linda or call 276-698-4494. Also check our FB page! Hampton Health Department is offering a new Baby Basics Moms Club, free and open to all pregnant women in Hampton. Meetings are on Tuesdays from 10 to 11:30 a.m. at West Hampton Community Center, 1638 Briarfield Road. The group is funded by the Maternal and Child Health Block Grant and collaborates with the March of Dimes. Each Moms Club meeting is led by trained facilitators and focuses on health aspects of pregnancy, from nutrition to substance use, along with advice on child safety, postpartum blues, and support for breastfeeding. The club is highlighted in the Daily Press , and go to the Hampton Moms Club page for complete details on future meeting topics. 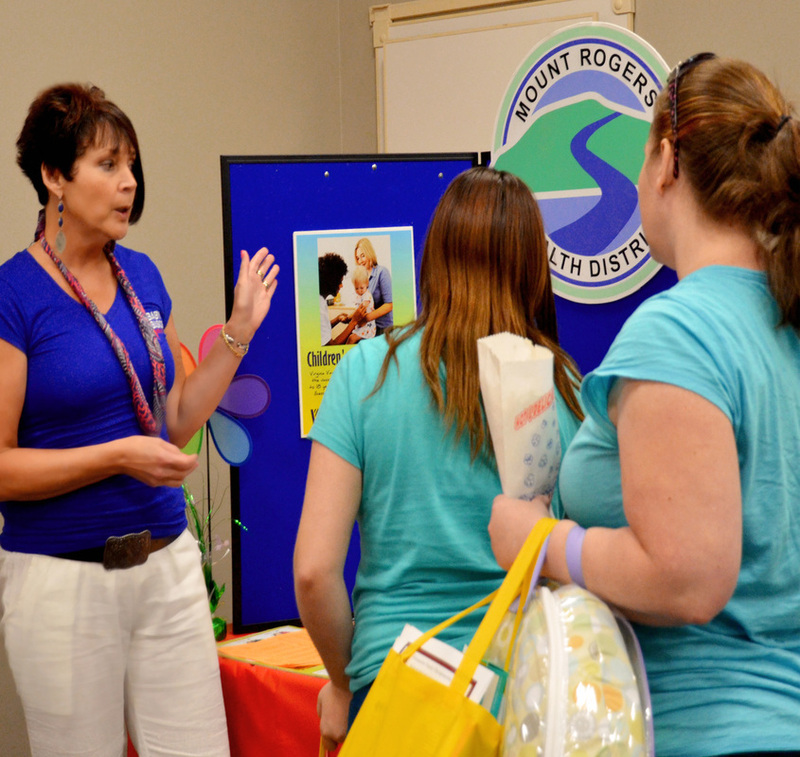 Bristol Regional Medical Center's New Life Birthing Center hosted their annual Women & Children's Expo on April 11th. Our Bristol Moms Club was there to provide information to expectant moms about how 'Before Baby' Moms Club can help throughout their pregnancy. Thanks to all who stopped by. 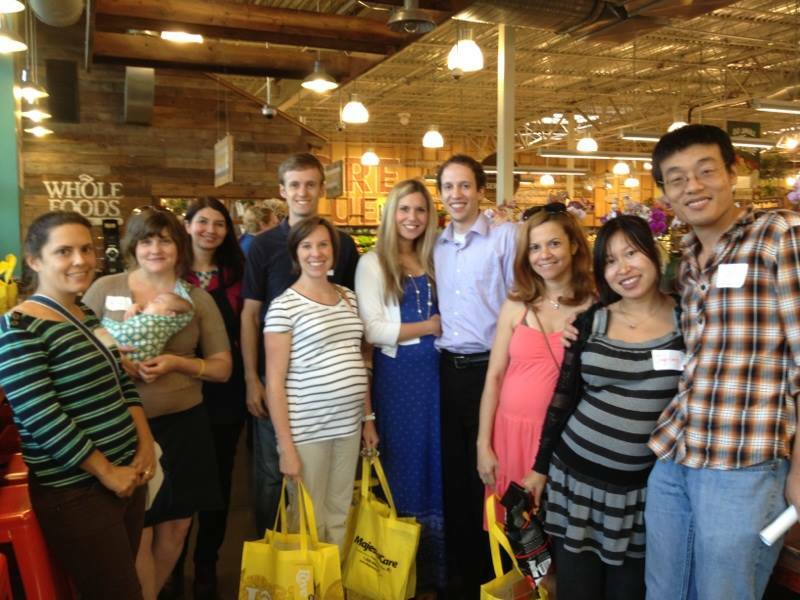 The Charlottesville Club held the first shopping tour on Monday, June 23 for pregnant Moms Club members and guests. They were treated to dinner, received information about healthy shopping choices, how to read food labels, and samples during the tour. Thank you, Aubrey, for the wonderful and informational shopping tour. Thanks to the generosity of Whole Foods for co-sponsoring dinner and providing a free bag of groceries to the pregnant moms. Thanks also to a grant to the University of Virginia from the March of Dimes, co-sponsor of dinner and for providing gift cards for moms to shop. Thanks to all who participated! 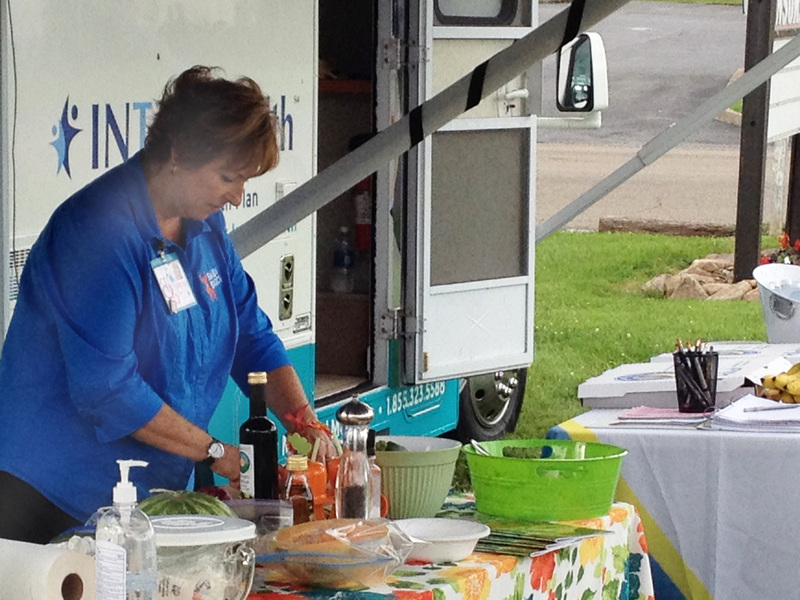 Carilion Roanoke Moms Club and Kroger hosted another "Nutritious Shopping on a Budget" event on Tuesday, May 27, 2014. They were accompanied by WDBJ7-TV who did a wonderful feature story for their Hometown Health segment. 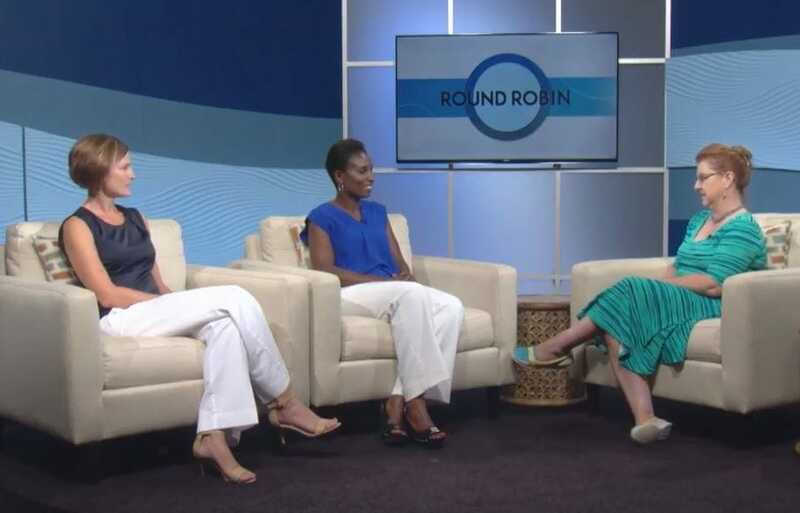 The interview shows the importance of good nutrition, as well as the many benefits Baby Basics Moms Club of Virginia has to offer expectant moms. Click here to watch the Moms Club interview. 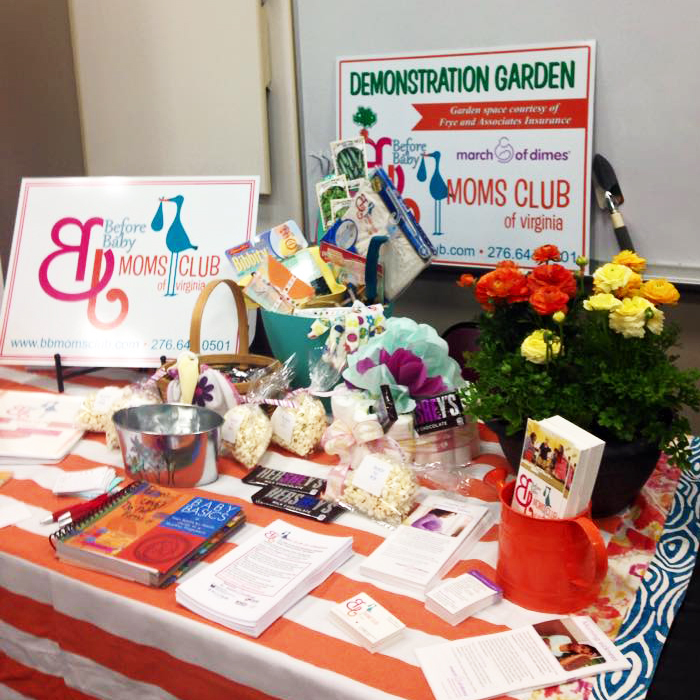 Southwest Virginia's Moms Clubs were well represented at Bristol Regional Medical Center's 2014 Women's & Children's Expo on May 3rd. 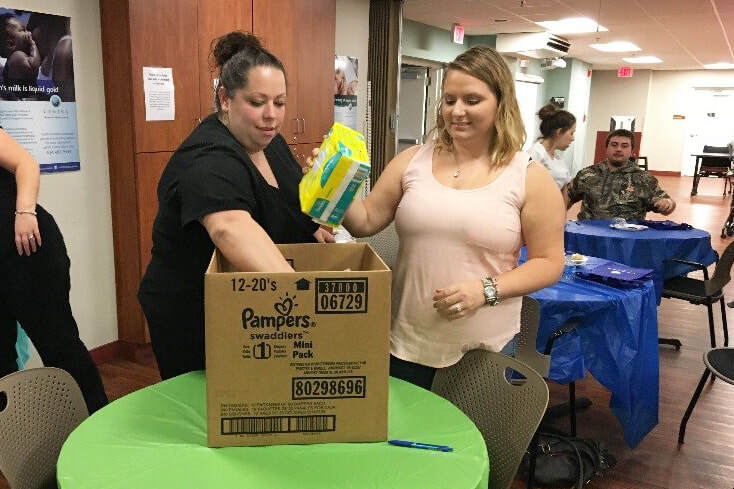 We gave away some great prizes and enjoyed talking to expectant moms and family members about how Baby Basics Moms Club can help with their pregnancy. Linda (L) from Bristol Moms Club and Karen (R) from Washington County Moms Club were on hand to talk to visitors about resources available for moms & babies in the community. Baby Basics Moms Club of the New River Valley went on their second Kroger shopping tour April 28th, 2014. 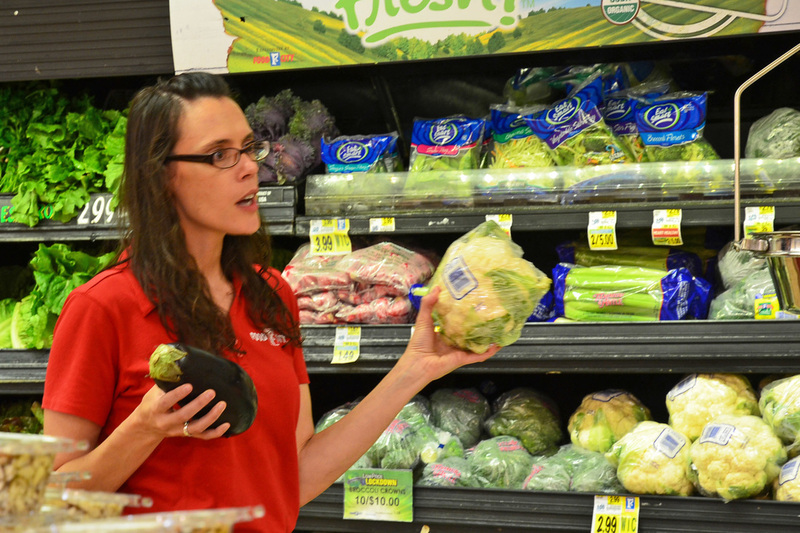 Suzanne Bryant, Registered Dietitian, discussed how to shop the perimeter of the grocery store for healthy options and shopping on a budget. Special thank you to the management and staff of South Main Street Kroger in Blacksburg for making our tour a wonderful success! Click to read more on the NRV page. A free car seat safety check and installation demo was held Monday, March 24, 2014 at Toyota of Bristol at 5:45 p.m. Thanks to all our Moms and Dads who came to hear the information from the officers who are certified child safety passenger technicians. Charlottesville's two new Baby Basics Moms Clubs were introduced as great resources for area women in the March 2014 newsletter of ParenTeen. ParenTeen is a program of Jefferson Area CHiP (Children's Health Improvement Program). Click here to access the newsletter on the Charlottesville UVA page. Moms & guests receive reunion "goodie" bags. Think grocery shopping can’t be fun? Do you find menu planning tedious and boring? Are nutrition labels confusing and frustrating? Come shopping with Roanoke Moms Club on August 13th and we will take the confusion out of preparing healthy meals on a budget! Click to go to Roanoke's page for details/registration. 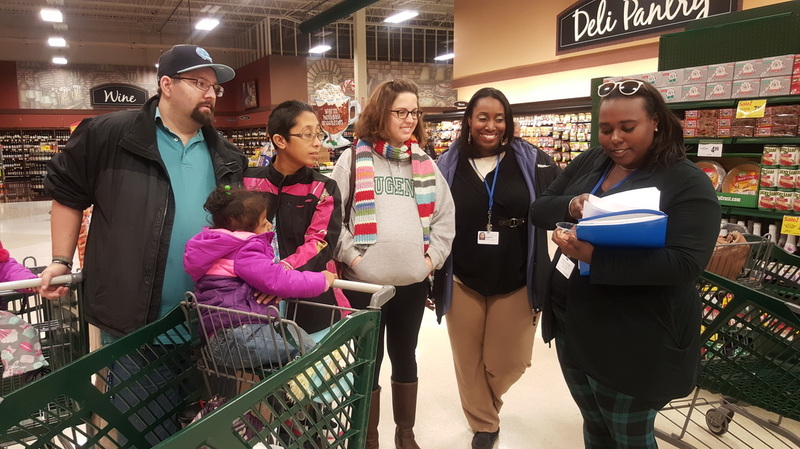 The Roanoke Moms Club is interviewed during a recent Moms Club Shopping Tour. Many thanks to Kroger and March of Dimes for their continued support of the Baby Basics Moms Club! Click to watch! Abingdon Moms Club is Here! The details have been finalized and our new Abingdon Baby Basics Moms Club is arriving May 7th for its first meeting! Club meetings will be on Tuesdays from 5:30 to 7:00 p.m. at People, Inc., 1173 West Main Street (across from Alison's Restaurant). Check the Abingdon BBMC page for more details and a full schedule. Tell any of your friends who might be expecting, or just bring them along. No sign up is needed... just show up for a fun and informative evening! Roanoke's Baby Basics Moms Club Reunion was held April 9th, 2013. Our Moms and their guests were treated to healthy snacks, door prizes, and a fun evening of sharing with other new and expecting Moms. The highlight of the event was meeting those beautiful babies after of months of waiting for their arrival! Click for more photos! 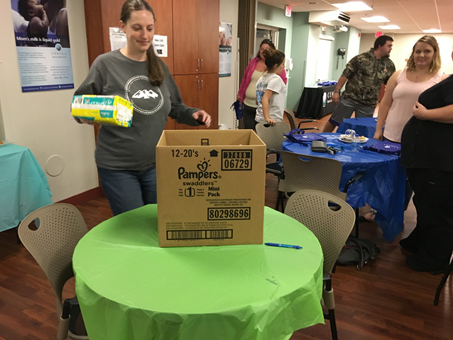 Baby Basics Moms Club sincerely thanks our community partners for their continued support in fulfilling our mission of healthier moms and babies in Southwest Virginia! The New River Valley Moms Club celebrated one year of success at their first reunion on April 30th, 2013. Just look at all those adorable babies and proud Moms! Click to go to the NRV page for more photos! 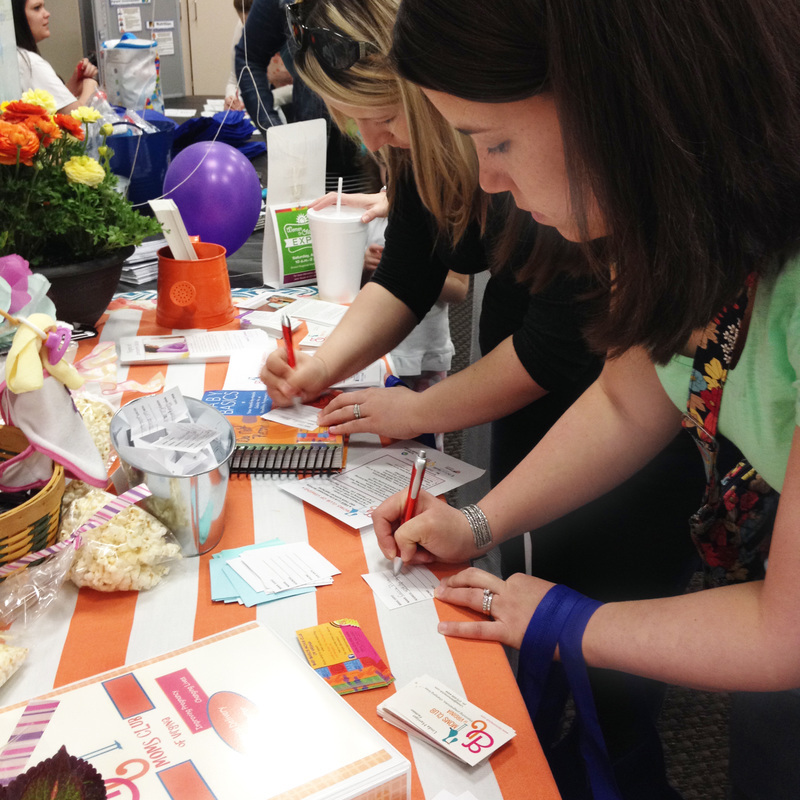 Kroger in New River Valley hosted a wonderful shopping event for our expecting Moms and their families on March 26th, 2013. Each Mom was given a budget and information to help them make nutritious food choices to make meal planning easier and healthier. 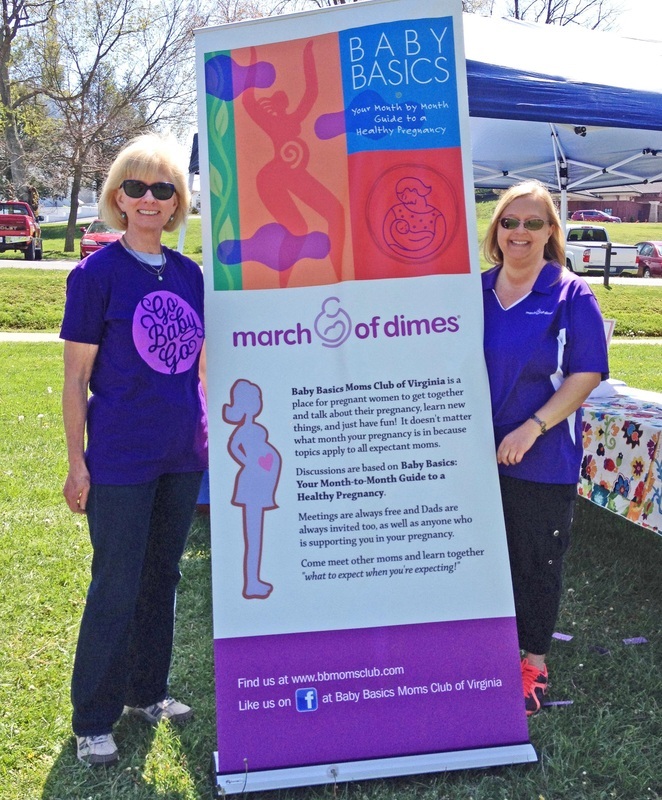 Our sincere thanks goes to Carilion Clinic NRV and March of Dimes for their continued support of NRV Moms Club! Click here to find more photos on the NRV page. Baby Basics Moms Club of SW Virginia is excited to announce a due date of March 15, 2013 for our new Spanish Moms Club, Hola Bebé in Roanoke at Carilion OB Clinic. Meetings will be on the 1st and 3rd Fridays of each month from 9:30 to 11:00 a.m., and as always is absolutely free for our moms and their support guests. Their calendar can be found on the Roanoke page. Visit our newest photo gallery to check out some wonderful photographs from our 2012 reunion held on October 1st at Bristol Regional Medical Center. We want to thank Nikki Hicks, March of Dimes Community Director, for being our very skilled photographer and providing beautiful memories of a fun-filled evening. Our sincerest thanks once more to Tanglewood Kroger, 4488 Electric Rd, for hosting a second shopping event for our Moms on November 14th, 2012. Your support is so appreciated by everyone associated with Baby Basics Moms Club of SW Virginia! On September 24th, 2012, our Bristol Baby Basics Moms Club sent seven expectant Moms on a Food City shopping mission with a menu in hand. The challenge was to make healthy grocery choices while staying within a set budget. Our Moms, and some Dads who came to help out, were coached by an expert team of Moms Club helpers. You can watch a video of their Food City adventure here.